My name is Eugenia and I am a certified, English, Italian, Spanish and Greek speaking licensed tour guide. Being born and growing up in a place where myths and history blended across centuries, I developed a keen interest in culture and archaeology and a great curiosity about foreign cultures and languages. 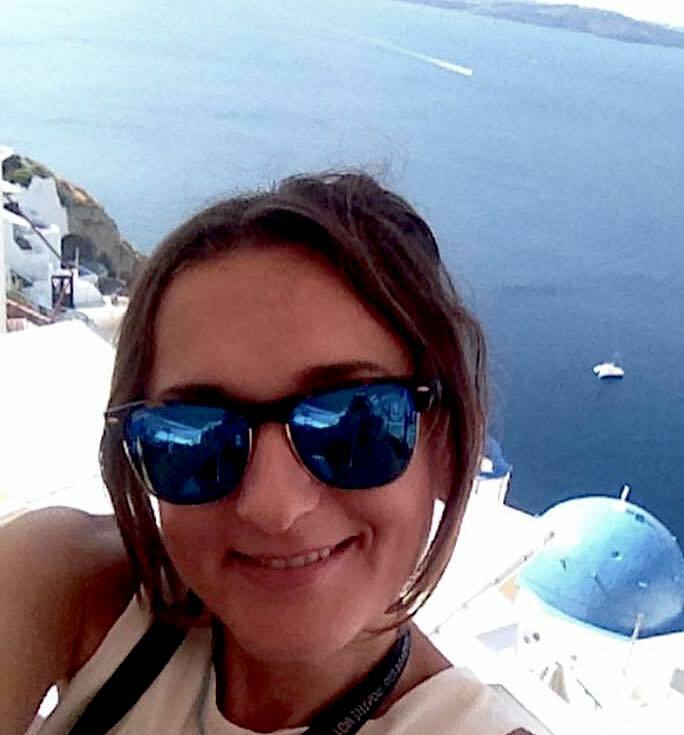 I studied Foreign Languages and Literature at the University of Athens, majoring in Italian and Spanish literature and continued my education at the National School of Tour Guides, in Thessaloniki. Three years of intense classes and numerous jobs as a tour-guide in the most important archaeological sites in Athens, Olympia, Mykonos, Thessaloniki, Meteora and Vergina has rewarded me with many fulfilling experiences. For the last several years, I have been working and living in Santorini. When I first set foot on this island, I immediately had a feeling of belonging. Santorini is a place combining simplicity with greatness: the true Hellenic essence! Its rich historical and cultural background, the wild volcanic landscape, the white houses contrasting with the Aegean blue, the Cycladic light, the magical sunset in Oia, its aromatic wines and delicacies of its land, the vivid traditions and hospitality of its inhabitants make Santorini my paradise on earth… which I invite you to come and experience with me. In this tour we visit one of the most impressive archaeological sites in the world: Akrotiri, considered to be a “Prehistoric Pompei”. It was a cosmopolitan port that was destroyed at the peak of its power 3600 years ago by the tremendous volcanic eruption that created the caldera and the Santorini we see today. Akrotiri is preserved in excellent condition because of the volcanic materials that were ejected during the eruption “mummified” the whole settlement. We will wander around and admire the spectacular prehistoric civilization under the brand new bio-climatic shelter that keeps the temperature comfortable no matter how it is outside. We will be walking on the prehistoric cobblestones roads and admire the private dwellings, the giant public buildings, the perfect urban plan of the city and the sewage system created during the Late Bronze Age. Rare pieces of ceramic, astonishing wall paintings and many other findings will be seen and explained in a way that will bring the past to life. Akrotiri brings to mind the Atlantis described by Plato – the story about a prosperous land that disappeared without trace, sunk into the sea by the anger of gods. Today, the archeological site of Akrotiri is by far one of the major attractions in all of Greece. The site attracts lovers of mystery and is a favorite for all ages. The best way to explore this wonderful island! Whether you want to take lots of photos and create your own post cards, whether you want to enjoy the island in a relaxing way having the chance to see (almost) everything, whether you like seeing the details of every site that you visit, even through a panoramic tour over the island with a helicopter, or even if you want to enjoy a fresh home made food prepared with the catch of the day and produced from the local vegetable gardens in places where the islanders go or even at worldwide renowned restaurants, we can put it together in the Santorini custom tour! We will explain everything to you and create a personalized itinerary. 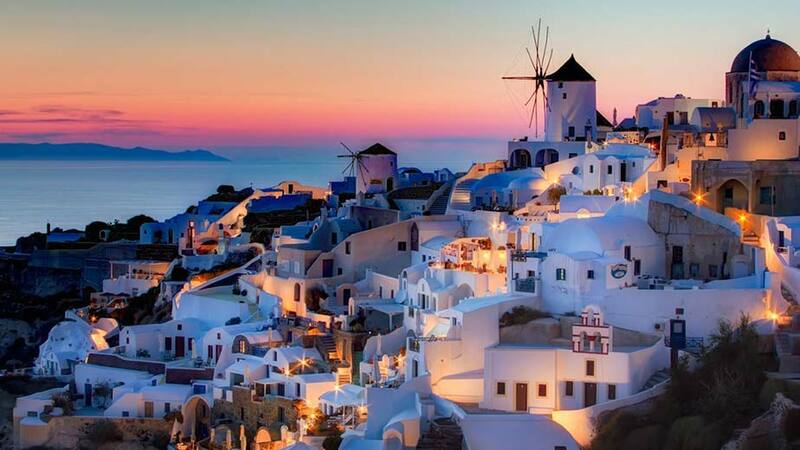 With this tour you will go to all the places you see in postcards of Santorini. A 6 hour tour that will allow you to take your own unique pictures, and its important landmarks. The tour starts off wherever is the most convenient place for you. After several short photo stops at some of the most famous spots of the island (the caldera view point, the blue domed church, the cave houses) we drive towards the Northwest where we visit the picturesque village of Oia, where we will see the amazing mosaics of the colored roofs, the endless labyrinth of curving streets, and enjoy the most dramatic vistas across the caldera, stopping for a Greek coffee or a refreshment. The black sand beach of Kamari will follow. Then the panoramic view of the island from its most elevated point: the mountain of Profitis Ilias. After a short drive through the dramatic scenery of the island we visit one of the wineries for you to enjoy the most renowned product of the volcanic earth through some of the award winning wine labels. 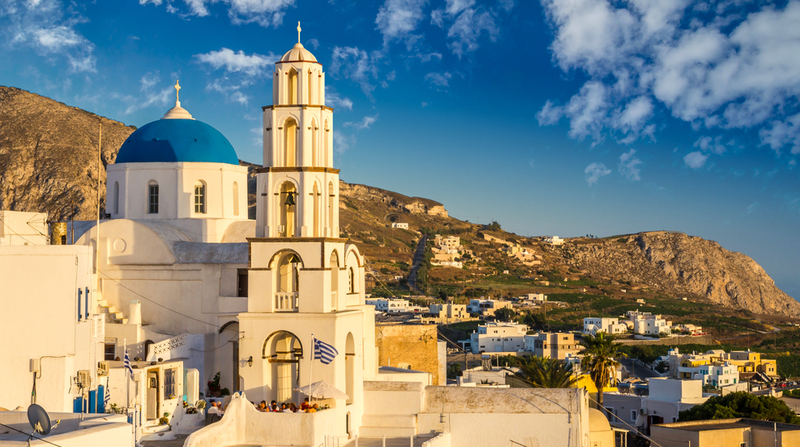 This excursion with stops in numerous places all over the island gives you the chance to experience the history, the energy, the products, the spirit and the everyday life of Santorini. A 4-5 hour tour in the less visited gems of the island! Visit the medieval settlement of Pyrgos and get a tour of its fortress where we walk in the narrow, labyrinth streets in the shadow of the steeples and the blue domes of the churches from another era. We then socialize with the islanders under the shade of a tree in the square of the picturesque village where they will be drinking their traditional Greek coffee or some ouzo, of whoch we too may partake. We then enjoy the panoramic view from the most elevated part of the island: the monastery of Prophet Elias. Then a satop at one of the wineries as well as several photo opportunities in the most interesting places on our way. After that we stroll around the traditional part of the medieval settlement of Emporio, and feel the Aegean Sea breeze on one of the black sandy beaches of Santorini. This tour is especially designed for those who want to sample an alternative experience back to Medieval times and feel how life in Cycladic islands was in the days when pirates invaded, and also witness the typical daily life of the locals. We will them walk the narrow streets of the traditional village of Pyrgos to its castle. If you are eager for one-of-a-kind experience, then this 5 hour tour is the ideal choice for a splendid afternoon in Santorini! The Made in Santorini – Experience tour begins with visiting a traditional farm where the farmer-owner welcomes you and shares the stories of his family heritage, shows you the unique ways of cultivating while revealing the secrets of the volcanic terrain of Santorini. You will be able to see, taste, touch and sample, first hand, the: freshly picked tiny tomatoes, white eggplants and fava beans, as well as local wine-straight from the barrels, all of which Santorini was famous for before the age of tourism. Our next stop we will travel back 3600 years to explore the lost Atlantis as we walk in the narrow streets of a port city which was buried under thick layers of volcanic materials and ashes where we will see the advanced technological achievements, the wall paintings, and the history of Akrotiri narrated as we explore the perfectly preserved buildings of the city. We will also stroll through picturesque, medieval fortresses and see the incomparable panoramic views. 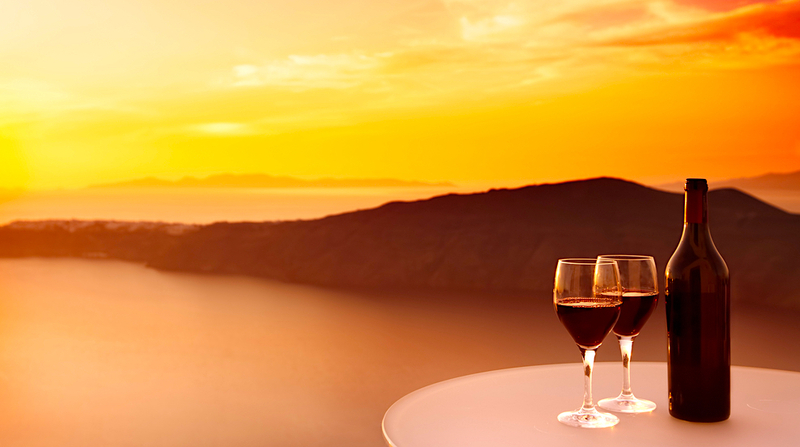 At our last stop we have reserved a breathtaking spot where you can watch the sunset over the Aegean Sea and the caldera as you sip local wine. This tour is ideal for travelers who want to make the most out of their precious time on Santorini and offers a great opportunity to experience not only the taste, but also the history, but also the secrets of this wildly beautiful place blended with authentic Greek hospitality! Visit the archeological, architectural and geological gems of Santorini! First, we will have a tour of the most important archaeological sites of the island, Akrotiri, which is located at the southern part of Santorini. For 3600 years the city was totally hidden when it was destroyed during one of the most violent catastrophes ever experienced by mankind: the eruption of the Santorini volcano. The volcanic ash preserved everything in excellent condition and now we can admire and be astonished by the achievements of the inhabitants of the marvelous prehistoric city of Akrotiri. Afterwards we cross the biggest and the most dramatic part of Santorini, admiring some of the landmarks as well as the dramatic landscape and the rich cultivation of the island. We then reach the northernmost part of the island and the village of Oia, the most charming village in Santorini, which will undoubtedly give you some of the best memories of your visit. Enjoy a relaxing walk and get inspired by the unique beauty of the traditional settlement and the postcard like views at every turn. Then, we hop on our boat and sail for a caldera exploration. During our mini cruise you will have the chance to admire the unique lunar-like landscape of the caldera as we will be approaching the active volcano and the thermal springs. We will take you to swim in hidden places where you can feel the energy of this majestic place.